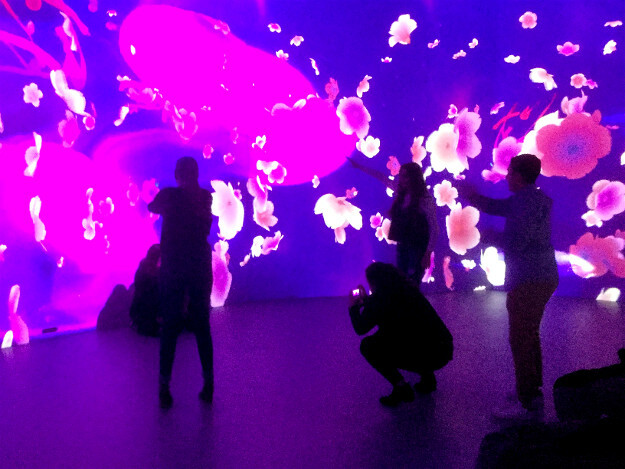 ARTECHOUSE, one of my favourite hangouts in DC, launched a brilliant new immersive experience last week. It’s called “In Peak Bloom”, and it’s perfectly timed for the arrival of Spring in Washington. You can see a sample of the new show in the above video. 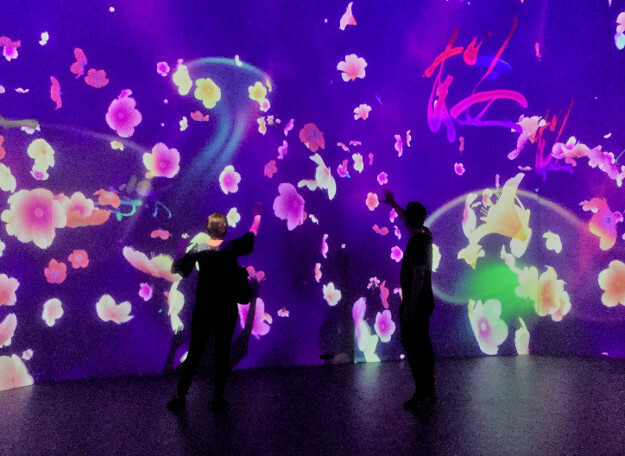 The projected HD graphics respond to the movements and gestures of members of the audience, making them participants in this a highly interactive environment. ARTECHOUSE has outdone Itself with this one. A little added touch. At the Augmented Reality Cocktail Bar in ARTECHOUSE, the coasters at the bar let you compare the “normal” appearance of a drink, on the left, with the augmented version, on the right. 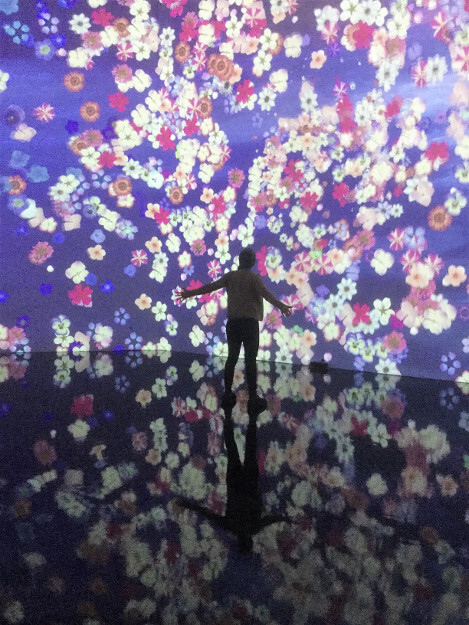 This entry was posted in Uncategorized and tagged ARTECHOUSE, In Peak Bloom on 25 March 2019 by bcarter3. 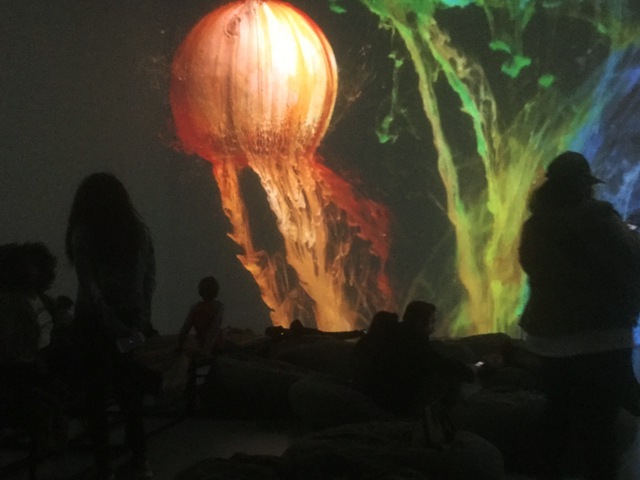 I had a delightful visit from my Left Coast brother and sister-in-law this week, which included another trip to ARTECHOUSE, to see touch experience the current “New Nature” installation. I’ve never been able to come close to capturing the HD quality of ARTECHOUSE’s visual displays with my IPad, but I’ve found some online samples from the shows. 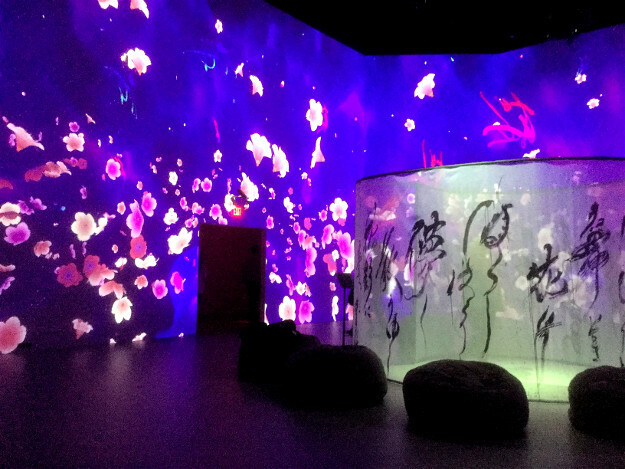 In “New Nature”, a side room contains “The Menagerie”, a collection of large monitors displaying fluid abstract designs. The “creatures” on screen respond to the hand movements of the person watching the monitor. Here’s an overview of the current installation. 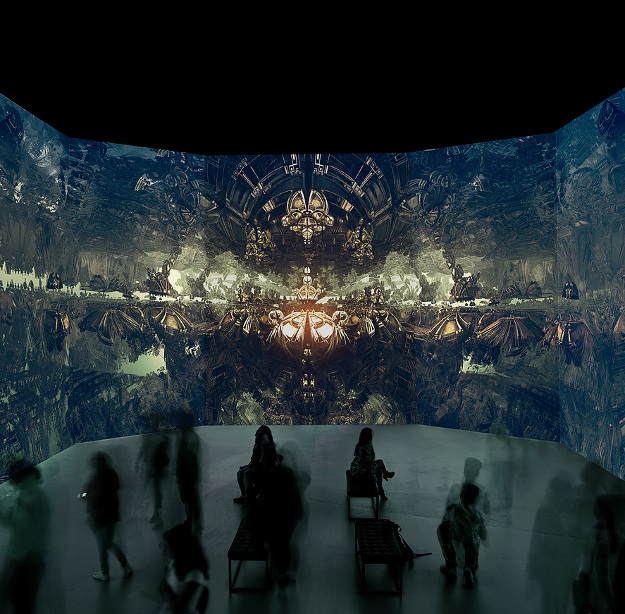 The main room, at the start of the video, is 24 feet high*, and the installation covers 270°. Love this place! ARTECHOUSE has become one of my favourite hangouts in Washington. *To put that in perspective, imagine four six-foot-tall people, standing on each other’s heads. Or imagine six four-foot-tall people, standing on each other’s heads, if that works better for you. The point is, it’s big. This entry was posted in Art, Museums, Technology and tagged ARTECHOUSE, New Nature on 3 November 2018 by bcarter3. 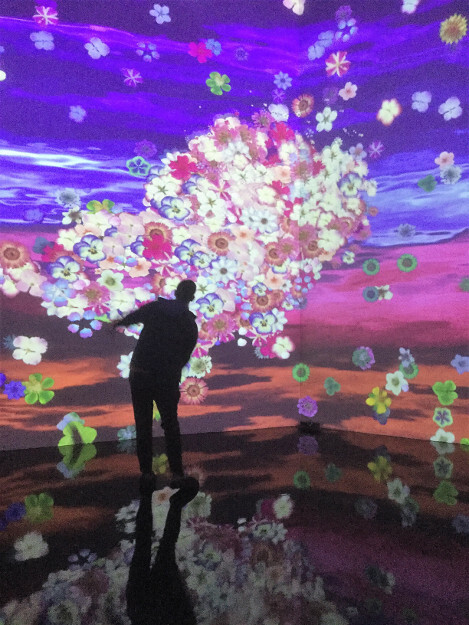 The current show at ARTECHOUSE, “Fractal Worlds” by Julius Horsthuis, is the venue’s most impressive immersive experience since Thomas Blanchard’s “Kingdom of Colors” played last November. 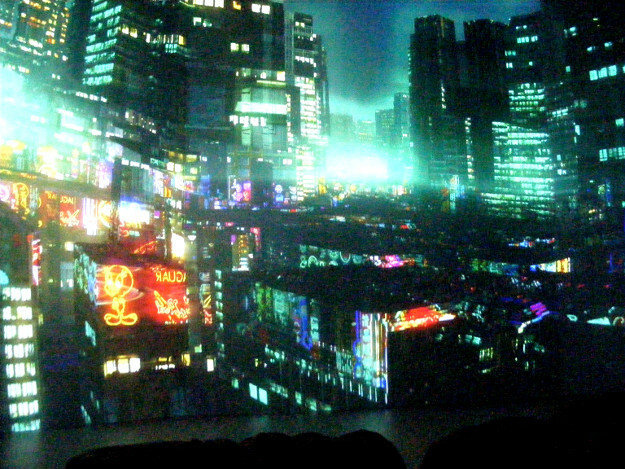 Here’s a brief video I took at the site, offered with the usual apology: My decidedly low-tech hardware comes nowhere close to capturing the beauty and power of the huge HD projections on the site’s walls. The image at the top of this post is from the program notes, and gives a hint of the clarity and detail of the show. 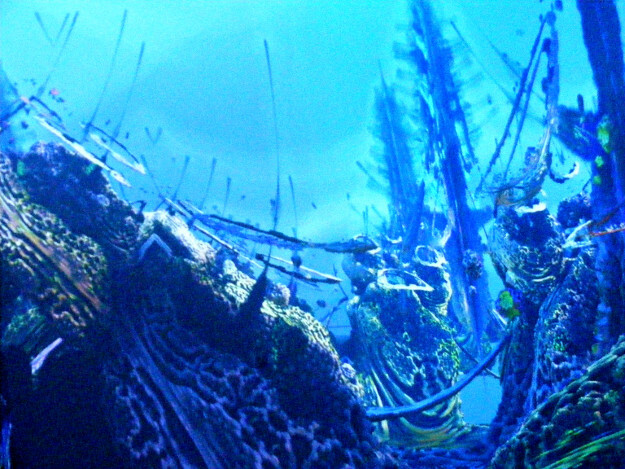 This entry was posted in Art, Design, Photography, Technology, Video and tagged ARTECHOUSE, Fractal Worlds on 29 July 2018 by bcarter3. I was away from Washington during this year’s cherry blossom peak bloom, which is one of those times when the city is at its most beautiful. By the time I returned, not a petal remained. 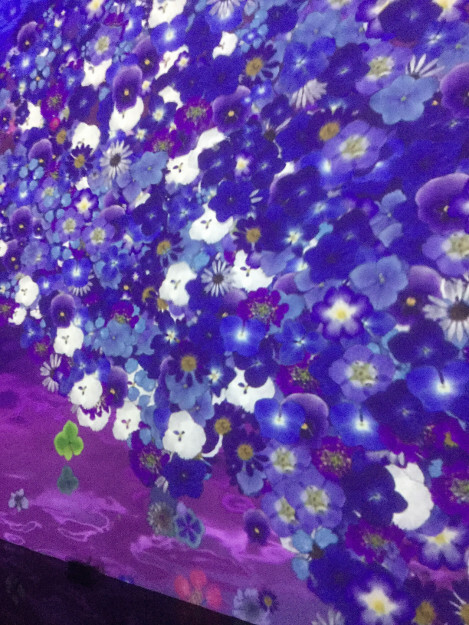 But I got back in time to make it to the Sakura Yume’s immersive “Cherry Blossom Dream” at ARTECHOUSE. The display reacts to body movements and gestures, so you can throw splotches of colour on the walls simply by waving your hand. 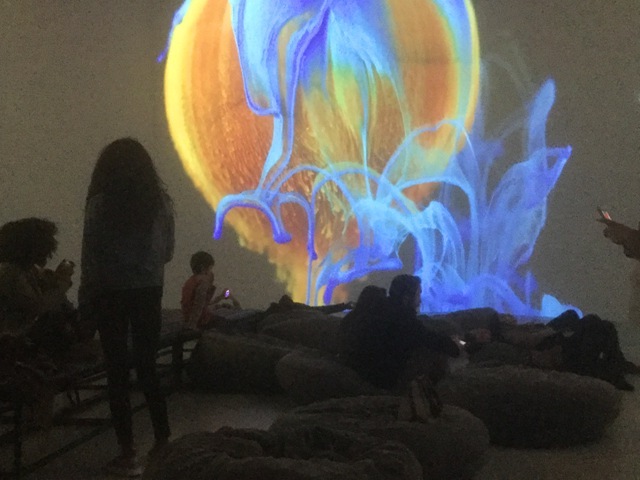 This was my fourth or fifth visit to ARTECHOUSE, and some of my initial fascination with the concept has diminished as my familiarity with it has increased, but it’s still a wonderful place to spend an hour or so. This entry was posted in Art, Music, Nifty, Performance Art and tagged ARTECHOUSE, Cherry Blossom Dream on 15 May 2018 by bcarter3. 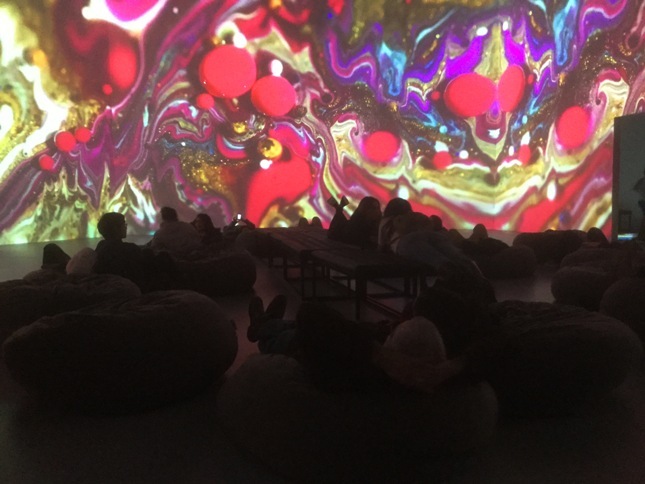 Here’s some video I shot during a daytime visit to ARTECHOUSE’s “Kingdom of Colors” installation, which I wrote about yesterday. 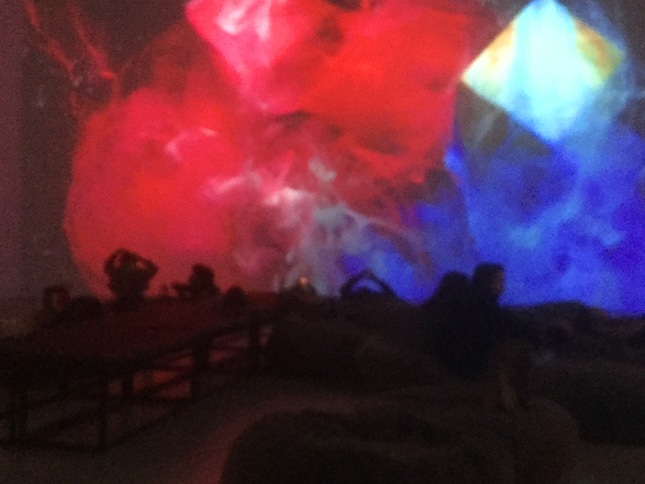 Because it was shot in a darkened room, the video quality is poor, and the sharp and saturated colours of the projection are blurred and murky, but this should give you some idea of how it felt to experience the show. Watch it on full screen for best results. What an intoxicating afternoon I had! Since I’m going to post videos, I’ll spend a couple of days learning about video editing and use of editing features. Simply slapping together random strings of raw footage might be good enough for Michael Bay and Uwe Boll, but my viewers deserve better. This entry was posted in 2018 New Year's Resolution, Architecture, Art, Design, Nifty, Photography, Technology, Video and tagged ARTECHOUSE, Kingdom of Colors, Leonardo Villiger, Oilhack, Thomas Blanchard on 16 November 2017 by bcarter3. For maximum effect, enbiggen the video to full screen. Then imagine it covering 270° of the walls in a darkened room three or four stories high. 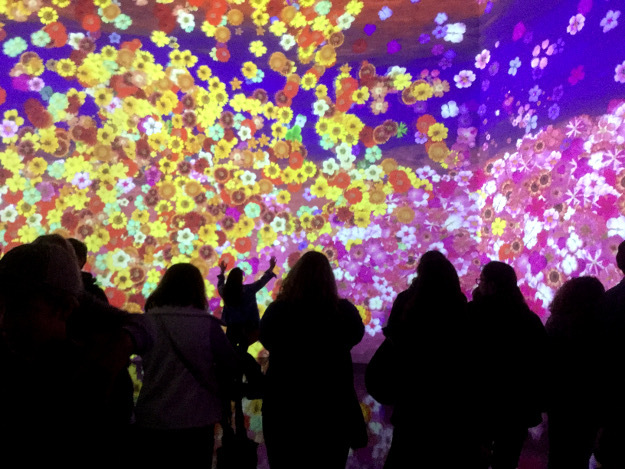 That’s what you experience at “Kingdom of Colors”, the current art installation at ARTECHOUSE in Washington. It’s the creation of French filmmaker Thomas Blanchard—who was on site when I visited—and artist Oilhack, with a soundtrack by Lyon-based composer Leonardo Villiger. It’s like being surrounded by a high-tech, high-def, 21st-century version of a classic psychedelic light show. 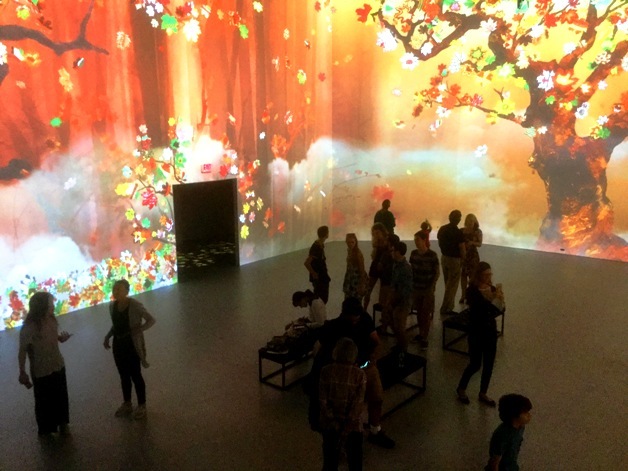 ARTECHOUSE–that’s “ART-TECH-HOUSE”—opened in Washington a few months ago. As the name implies, it’s a space that showcases the spectacular possibilities of combining art and technology. 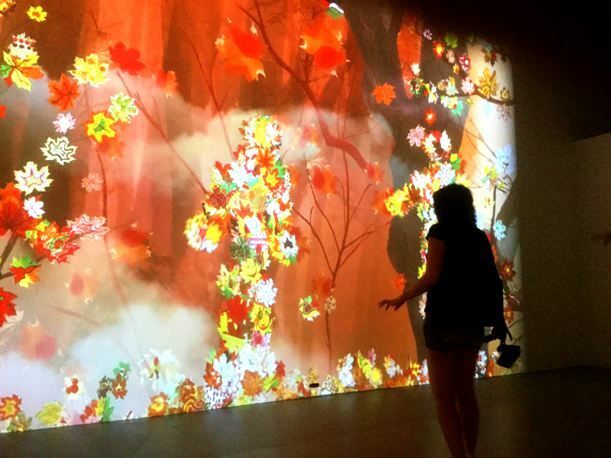 “Kingdom of Colors” is ARTECHOUSE’s the third immersive experience. I missed the first one, but posted an item about the second, “Spirit of Autumn”, earlier this month. 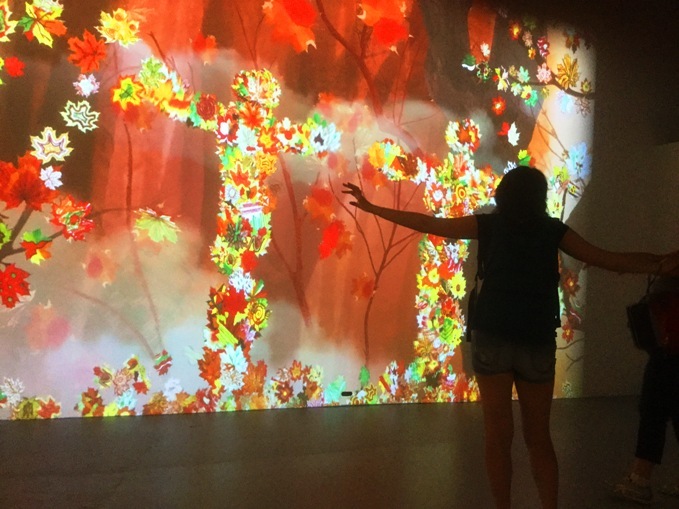 “Spirit of Autumn” was highly interactive, with the mobile imagery on the walls and floors responding to the movements and sounds of the visitors. “Kingdom of Colors” is a more passive experience. 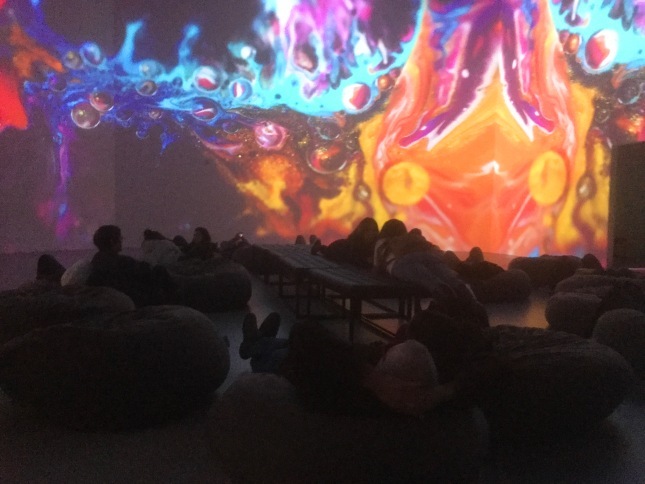 Large cushions invite viewers to sit or lie on the floor and let the trance-like music and the awesome visuals carry them away. “Kingdom of Colors” is open to anyone over six years old during the day, and lots of children and parents show up. Evenings, when the bar offers wine and mixed drinks, are for people over 21. No smoking of any kind is allowed. Guests are admitted in small groups, on the hour. There’s no limit on how long you can stay, and for this show, it is very easy to, uh, space out and lose track of time. “Kingdom of Colors” is only here for a short time. It opened on 10 November 2017 and runs through 26 November 2017. Reservations are absolutely essential. Many of the remaining shows have already sold out. *It brought back memories of a time long ago, when a friend and I spent most of one summer researching the contrasting perceptual effects of watching the light show from 2001 under the influence of a wide range of pharmaceuticals and herbs. This entry was posted in Architecture, Art, Design, Nifty, Photography, Technology, Video and tagged 2001, ARTECHOUSE, Kingdom of Colors, Leonardo Villiger, Oilhack, Spirit of Autumn, Thomas Blanchard on 15 November 2017 by bcarter3. ARTECHOUSE is a newish interactive art space a few blocks south of the National Mall in Washington, DC. 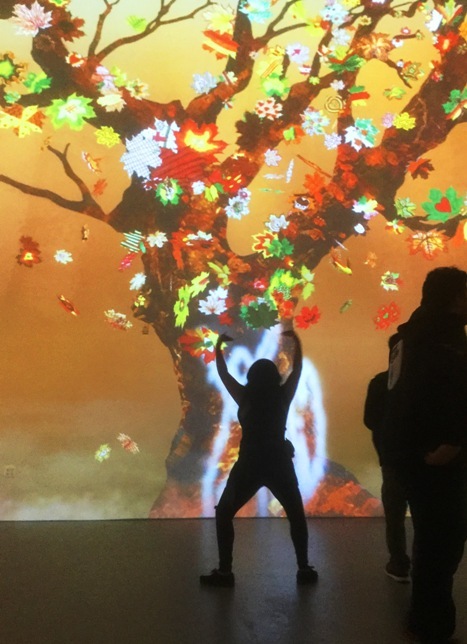 Since I’m an easy mark for anything advertised as an “immersive, sensory art experience”,* I headed down to check out the current installation, “Spirit of Autumn”. It didn’t disappoint. Here’s how it works: “Spirit of Autumn” is open in the evening for people over 21, and during the day for anyone over six years old. In the evening, the bar offers wine and mixed drinks, and the walls change to a darker, bluer colour scheme. Guests are admitted in small groups, on the hour. There’s no limit to how long you can stay, but people generally spend about 45 minutes on site. You can reserve a slot online, and many of the more desirable times sell out early. Most of the action interaction takes place in the large room you see in the above pictures. (The one at the top of the column is from ARTECHOUSE; the others are mine.) The images on the walls are in constant motion, with leaves seemingly blown by the wind. If you approach a wall, the leaves coalesce, and echo your form and movements. Other parts of the wall turn your silhouette into a ghost-like image. There’s more. 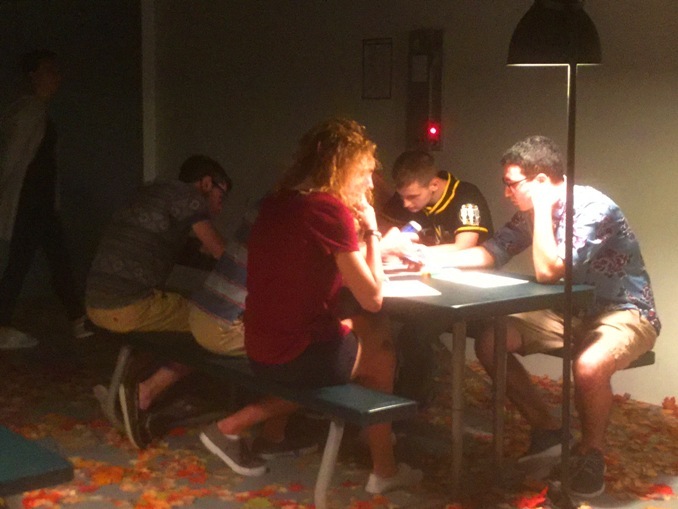 In small spaces off the main room, you can toy with other interactive experiences. The video at the end of this item has examples. And at the end of the line, there’s a workroom where you can design and colour your own leaves, some of which will be incorporated into the show. The leaves respond to a child’s movement. The image collapses when he gets too close, and reconstitutes when he moves away. When you walk down a dark hall, leaves on the floor rush to follow you. The walls react to the movement and sound of the visitors. In some places, they create ghost-like reflections. Clapping in certain parts of the room brings about rain and lightning. Blobs of colour track your footsteps. The lady with the dancing leaves. *God, do I miss laser shows! I wonder if they’ll make a comeback, now that marijuana is legal in the Blue States. This entry was posted in Architecture, Art, Design, Nifty, Photography, Technology, Video and tagged ARTECHOUSE, Spirit of Autumn on 1 November 2017 by bcarter3.